Patrick Dowd began his master’s degree in International Educational Development at Penn GSE in fall 2015. 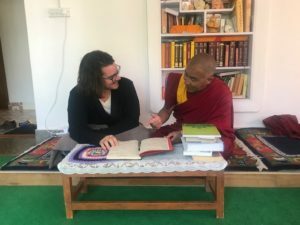 Through the support of a Foreign Languages and Area Studies (FLAS) fellowship, granted by the South Asia Center (SAC), Patrick studies Tibetan at an advanced level with the South Asia Studies Department. His coursework focused on indigenous education and language revitalization in Tibet and the Tibetic-speaking Himalayas and included five months of anthropological research and educational development work in Ladakh, India and the eastern Tibetan region of the PRC through the support of grants from the Center for the Advanced Study of India (CASI) and Penn Global. He concluded his master’s degree this summer through an internship with the Education Department of UNESCO Nepal, where he worked at promoting the 123 indigenous languages of the Himalayan nation. Prior to beginning his graduate studies, Patrick lived with Tibetan communities in the Himalayas for three years, first on Fulbright Fellow and then through AIIS Tibetan language studies grants. Later he pursued independent study under Tibetan scholars. Patrick is currently at an elevation of nearly 12,000 feet, in the culturally Tibetic region of Ladakh, India. He founded, and is currently directing, a project to oversee the writing, illustration, publication and distribution of a Bhoti (literary Tibetan/Ladakhi) children’s book grounded in the indigenous values of Ladakh. He is overseeing a team of more than 15 Ladakhi staff, conducting the entire project in Tibetan language. His year of advanced Tibetan language study at Penn was invaluable in helping him develop the skills necessary for this current work. You can read more about his project through his website. Learn more about Patrick’s work by reading his interview with SAC partners AIIS below. "AIIS: What are the goals of your project to create a Ladakhi textbook? PD: Recognizing an absence in the current Tibetan language children’s literature as well as the tremendous cultural changes affecting Ladakh, our project is the creation of a Ladakh-centric, culturally appropriate textbook to preserve the rich cultural heritage of Ladakh. Inspired by His Holiness the Dalai Lama’s teachings on secular ethics and moral education, this project seeks to maintain and promulgate the unique heritage of Ladakh through the first textbook of its kind, presenting centuries-old values and traditions to youth using modern curricula developed specifically for them. Through our project, we hope to not only make a significant contribution to the corpus of Tibetan language children’s literature but also to perpetuate the values of altruism, compassion and interdependence that have defined Ladakhi culture for generations. Our project is being overseen by a Board of Directors that includes Ladakhi educational specialists from Buddhist, Muslim, and Christian communities, the major religious traditions in Ladakh. Our team recognizes that the same ethical values underlie all of these these great religious traditions which all have a long history in Ladakh. By working across these communities, we seek to preserve the shared cultural heritage that all Ladakhis hold in common. How did your experience with the AIIS Tibetan program prepare you for your current work? It was Gen la who first showed me the reverence Tibetans have for their language, every syllable of which is considered mantra. It was he who taught me that if I needed to dispose of old notes, I should take them to be burned at the monastery rather than throw them away. He also taught me to never place a book on the ground, never step over a single letter, but respect every book and piece of writing as though it were your teacher. I read my first Tibetan book under Gen Sangye’s guidance and now, four years later, I am directing a team of writers and illustrators here in Ladakh to produce a Tibetan textbook. And ever since that summer in 2013, I have never bought another spiral-bound notebook. To what extent do you rely on the Tibetan language in your work? Tibetan is indispensable and inseparable from my current project. None of my core team speaks English so all our communication is solely conducted in Tibetan. As their mother tongue is Ladakhi, Tibetan serves as our lingua franca. Furthermore, the book we are writing is itself entirely in Tibetan (or Bhoti, as written Tibetan is called here). So, the entire project is an exclusively Tibetan language endeavor, from A to Z, or Ka to A. How does the current project fit into your future professional and academic goals? Next year, I plan to begin a PhD in anthropology, keeping my geographical focus on Tibet and the Tibetic speaking Himalayas. Specifically, I will research the intersection of language revitalization, Buddhist revival, and ethno-national identity construction within the region. I aspire to continue wedding my scholarship with applied engagement with Tibetan and Himalayan communities, particularly in the field of language revitalization. Therefore, my hope is that this current book project will be the first in a graduated series, extending all the way to class 10. I am also optimistic that if our project here in Ladakh is successful, it can be used as a pilot for similar work elsewhere in the Himalayas. I would like to again extend my gratitude to Gen Sangye, his lovely family, and everyone at AIIS. AIIS provided me with an incredible opportunity that fundamentally changed the course of my life. Admittedly, the course of events started by AIIS has led me to a general deprivation of oxygen, money and internet, but I would not have it any other way. Thank you again. Thugs rJe Che!"